It is not just random chance that Star Trek featured a Scotsman as an engineer — Scotland has an amazing history of engineering. And of course this includes their toilets! 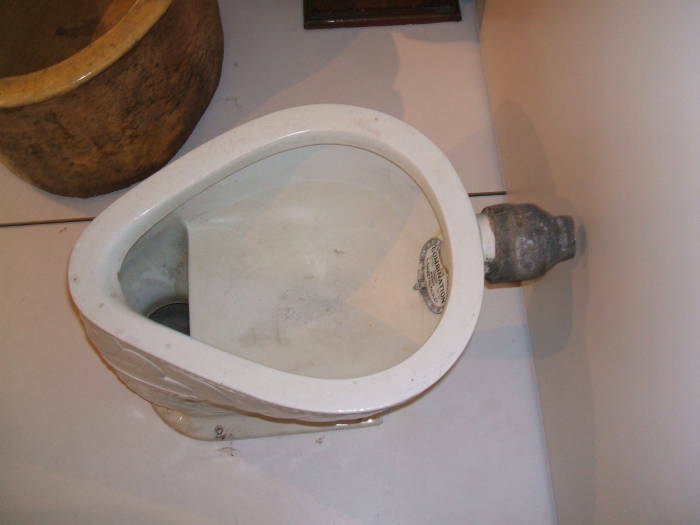 The National Museum of Scotland in Edinburgh has a great collection of Scottish engineering — mechanical engineering, electrical engineering, civil engineering, and all other forms of design and manufacturing, including some toilets from the late 1800s. The museum is in the Old Town or Auld Toun area, south of the Royal Mile beyond the Grass Market. It's an amalgamation, the National Museum of Antiquities of Scotland and the Royal Scottish Museum being merged in 1985, and the current National Museum of Scotland formed in 2006 by the merger of that with the existing Royal Museum. The mergers show in the variety of architecture, the Museum of Scotland is in a modern sandstone-clad building that opened in 1998, while the connected Royal Museum with its Victorian facade and grand central hall of cast iron opened in 1866. A section of the merged museums explains and demonstrates the industrial development of the Victorian era in Britain, including all the Scottish design and manufacturing. The developments influenced industry, but also home life. 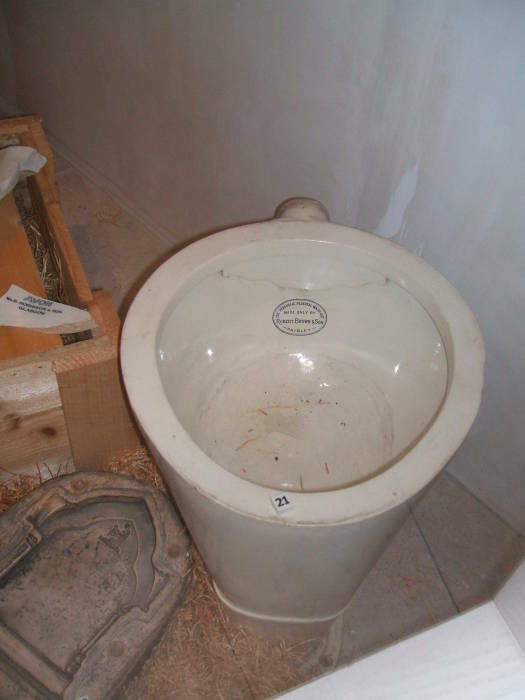 This is the water closet pedestal "The Combination", made by Doulton and Company at their Paisley works. 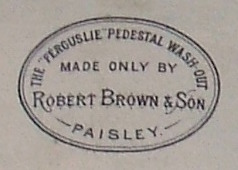 It is labeled inside the bowl: "The 'Ferguslie' pedestal wash-out". The Royal Doulton Company was founded in London in 1815. 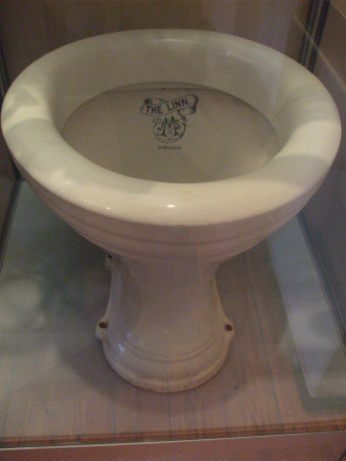 By the mid-late 1800s it operated factories in several locations in Britain, including those at Paisley, in the west-central Lowlands of Scotland, where this "Ferguslie" was manufactured. 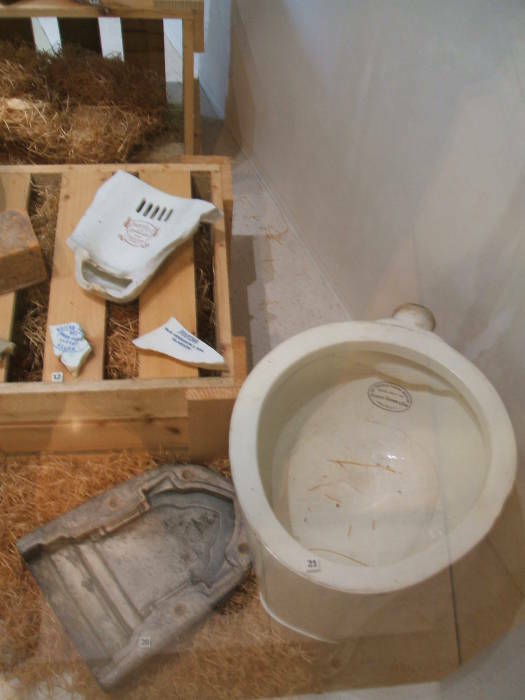 Also visible in the case are fragments of sanitary ware with trademarks of various Scottish manufacturers. One is from Shanks & Co. Ltd., in Barrhead, Renfrewshire. There is a piece of a Buick's Patent No. 1 Wash-Down Closet, made in Alloa, Clackmannanshire. Plus an Avon from W.B. Morrison & Son, Glasgow. Glasgow, of course, was a major center of the Scottish Enlightenment in the 1700s and has been one of the world's largest sea ports for centuries. Barrhead is in East Renfrewshire, eight miles southwest of Glasgow. It's close to Paisley, which is now on the west side of Glasgow. Alloa is in Clackmannanshire, the "Wee County", the smallest historic county in Scotland. It's just north of the Firth of Forth, the firth or estuary of the River Forth, which opens as a shallow fjord just north of Edinburgh into the North Sea. This puts Alloa close to the rail lines connecting Edinburgh and Glasgow, and closer yet to shipping facilities on the north shore of the Firth of Forth. 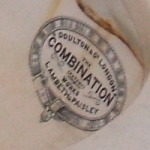 Here is another example of Doulton & Co's work, labeled inside the bowl as: "Doulton of London 'The Combination' (patent) works Lambeth & Paisley", manufactured around 1890. 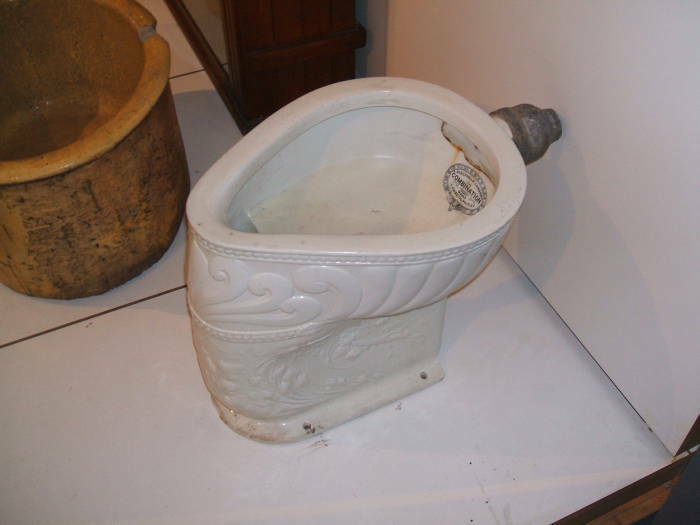 Other Scottish museums show off Victorian age ceramic developments. This model, The Linn, is in the history museum in Kirkwall, on the island of Mainland in the Orkney Islands just off the north coast of Scotland. 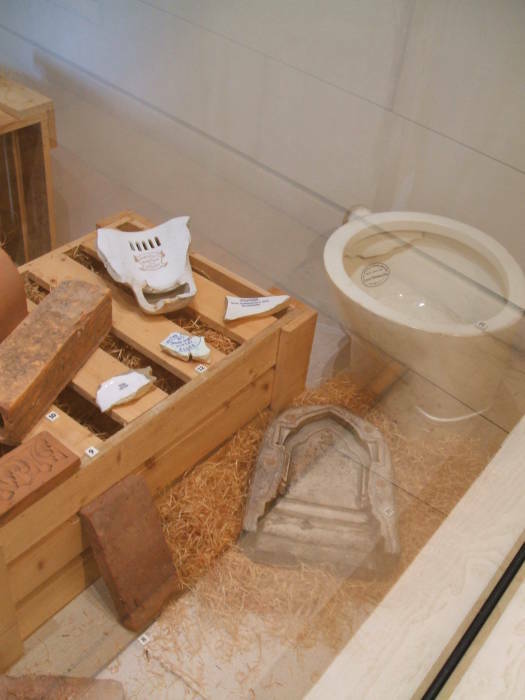 For much older toilets from Scotland and its surrounding islands, also see the Neolithic Toilet Page. Skara Brae, on the Orkney Islands off the north coast of Scotland, is a Neolithic settlement from approximately 3100-2500 BC, and its stone structures include what are believed to be Stone Age toilets. More recently, Saint Andrews and the Isle of Iona have ecclesiastical toilets from Medieval times. Saint Andrews' ruined priory latrine was used 1158-1518. Iona's religious community is significantly older, going back to the 500s. For British toilets in general, also see the British Toilet Page.